The 2012 Acura ZDX is a luxury all-wheel drive crossover with a distinctive couple-like appearance. With its steeply sloped roofline, Acura refers to the model as a 4-door sports coupe. The ZDX has a similar design to the more expensive BMW X6, which BMW calls its sport activity coupe. The ZDX’s sleek styling stands out among other crossovers. Some may view it as polarizing but it does make a statement. The ZDX has Acura’s front grille styling with a downward sloping roofline really cuts into cargo room. Leather seats, power seats, and 19” inch wheels are all standard features. The model also features the a very large panoramic sunroof, hand-stitched leather covering for the center console, dashboard, and door panels, and concealed rear door handles to add to its sporty floor. The model has 27.5 cubic feet of cargo room behind the rear seats and 57.3 cubic feet with the rear seats folded down. This is comparable to the X6, which has cargo volumes of 25.6/59.7 in these same dimensions, and the Infiniti FX (24.8/62). The ZDX does have more cargo room than the Land Rover Range Rover Evoque (20.3/51). The ZDX offers just one engine – a 3.7-liter V6 producing 300 horsepower. The model comes standard with a 6-speed automatic transmission. The ZDX gets EPA-estimated fuel economy of 16-mpg city, 23-mpg highway, and 19-mpg in combined driving, which is about average for its class. Premium fuel is required for the ZDX and the model is rated to tow just 1,500 pounds. According to Motor Trend, the 2012 Acura ZDX has a 0-60 time of 6.5 seconds, making it quicker than the Range Rover Evoque. 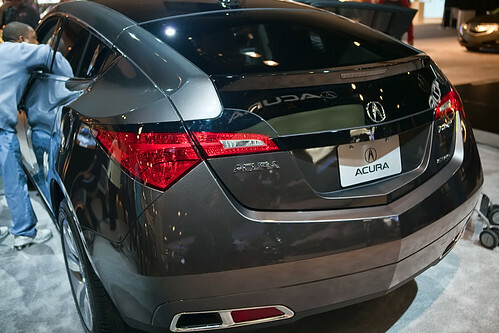 The 2012 Acura ZDX is an interesting mix of style and SUV capability. The model is built on the same platform as Acura’s three-row crossover the MDX. The 2012 ZDX has a starting price of $46,020 and comes with a host of luxury features. The model was designed and developed in North American and is assembled in Canada. The ZDX has changed little since the model was first introduced in 2010. For further impressions of this model, see Motor Trend’s long-term update for the 2010 version. Do you like the styling of the Acura ZDX?